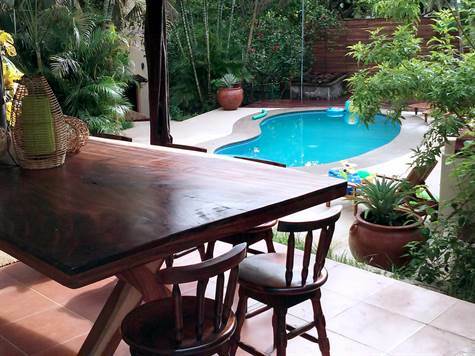 Casa Aigua is the perfect getaway in the heart Tamarindo. The gated property features a 2 bed / 2 bath main house with a 2 story guesthouse. The guesthouse has 3 apartments. Two 1 bedroom / 1 bathroom apartment and one 2 bedroom / 2 bathroom apartment. Casa Aigua has a pool and a new outdoor wood burning grill. The deck is new with stucco along the pool and pathways. There is a new solar hot water system, A/C, Cable TV, WIFI, washer / dryer, oven, fridge, microwave,... Just everything you need to enjoy your paradise in town. The property has a great rental income history with good reviews! The native landscaping features banana trees, mango trees and palms besides the plants and flowers. A good home for birds, monkeys, butterflies,... If you want this to be your home or rental income earner, don't hesitate contacting us.